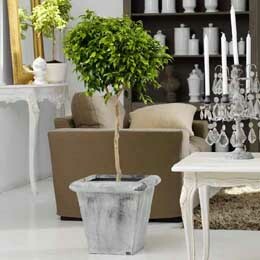 Name - Ficus benjamina the famous and popular weeping fig. Pronounced FY-kuss, it is the Latin name for fig. Varieties - They come in many shapes and sizes: large, small or standards (a mop-top on a trunk) and braid (three trunks plaited together) and leaves can be green or variegated. Care Tips - Weeping figs do not like change and can respond to altered routines or conditions by dropping their leaves in shock. These will regrow once the plant is settled. They often lose some leaves in winter but put on new growth either at once or in the spring. Do not over-water in this dormant phase.